Advertising revenue continues to be the bread and butter for many publishers. Over the last years, advertising revenue has changed its form; moving from traditional media to digital, mobile, and beyond. Following this digital shift, many publishers have adopted and are leveraging advertising in their email newsletter publications – i.e. email advertising – to generate a steady revenue source, accounting in some cases upwards of 20% of total ad revenue. 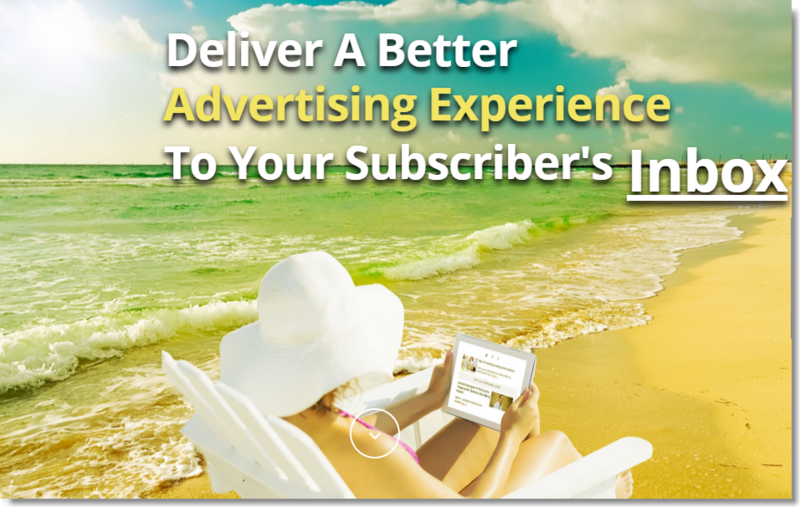 Ads in email are an effective ad format, albeit not as popular as other types of advertising. 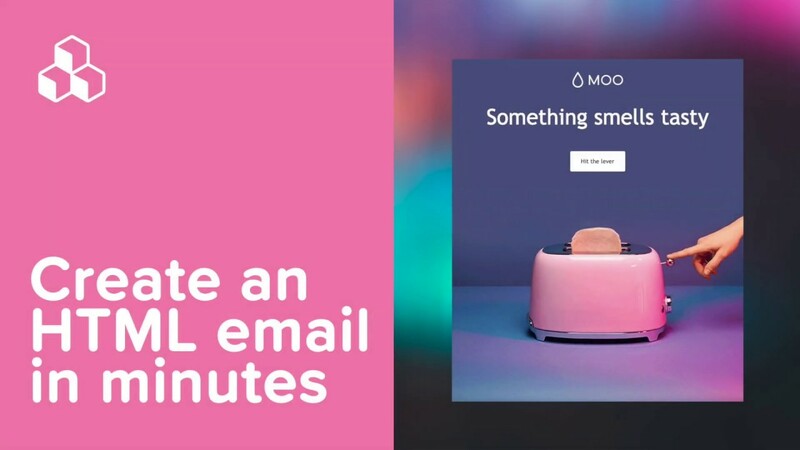 In this blog post we’ll shine a light into how ads in email are used by a number of publishers and provide you a snapshot of how they’re incorporating ads in their email newsletter publications, including which email ad types are being used, along with what’s the technology behind. The way ads appear in emails differs from brand to brand and publisher to publisher, but they tend to fall into three main categories: display ads, native ads, and sponsored emails. 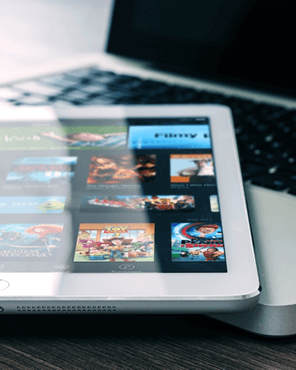 Display advertisements, also known as banner ads, are a form of ads embedded into a site—or in this case, into an email—that typically include static or animated images, a video, and/or text that communicates a marketing message. Display ads have been around pretty much since the internet has existed, and that means they’re in our email inboxes, too. But these days, banner ads are often considered outdated eyesores that people have learned to tune out. Click-through rates on banner ads have reportedly fallen to a meager 0.06% (way down from 78% on the first banner ad ever in 1994). However, despite fears of “banner blindness,” brands still use them. According to eMarketer, by the end of 2015, spending on digital display advertising in the US will total $27.05 billion. As you’ll see in our section on Display Ads in detail, advertisers and designers strive to be increasingly creative and clever with banner ads, vying for consumers’ attention, so you can count on continuing to see them in emails more and more. Many display ads you see in your browser while surfing the web are targeted, interest-based ads that are displayed based on your browsing history. These ads can be based on the content of the page you’re visiting, the registration information you provide, or they could be shown based on predictions about your interests generated from your visits to other web sites (via cookies). The AdChoices program has been around since 2011 and is managed by the Digital Advertising Alliance (DAA). Its stated goal is to provide consumers with information about how online advertising works and the choices you have. 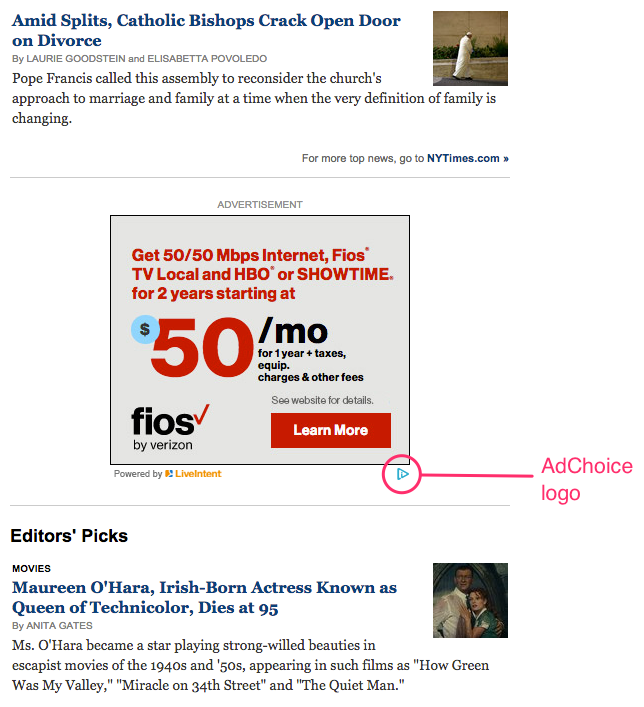 Click on an ad with the AdChoices logo, and you can control whether you receive interest-based advertising and from which companies. This type of display ads exist in email, too. Some publishers use a separate platform (like LiveIntent, which we’ll revisit in the Ad Networks & Tech Providers section) designed to place real-time advertising in email. 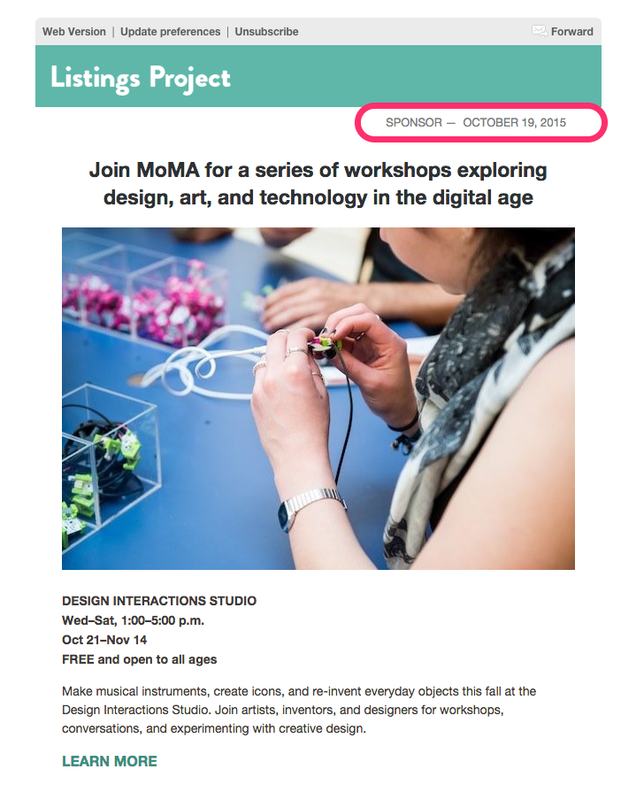 The moment an email newsletter is opened, a user-interest ad populates via HTML code. Here’s an example from the New York Times “Today’s Headlines” daily email. The ad for Fios was generated for me based on my internet activity or perceived interests, and as you can see below, “powered by LiveIntent.” Other readers opening the email will receive other display ads from participating advertisers. Native advertising—we’re sure you’ve heard the term. If you’ve wondered, “But what is it, exactly?” you’re not alone. Native ads can look different for different publishers. Essentially, it’s ad content that fits seamlessly into the existing content of the brand or publisher. The IAB describes it this way: “Native advertising is paid ads that are so cohesive with the page content, assimilated into the design, and consistent with the platform behavior that the viewer simply feels that they belong.” It’s emerged more prominently in the last few years as a way for marketers to engage with consumers on a new level—a way to connect with a built-in audience by providing quality content that could already be there, making it feel like a “native” or natural experience. Because there is no “standard” in native advertising, the approach has faced a lot of controversy. Readers have, at times, felt fooled by native ads that appeared to be “pure” journalism or regular site content only to find out what they’re reading is a paid advertisement. That’s why it’s become critical for native ads to be easily distinguished if brands want to maintain readership and consumer trust and loyalty. Here’s what a native ad looks like next to a display ad in The Daily GOOD newsletter, below. In this case, the native ad stands apart from the rest of the content with a shaded gray background and a “Presented by” label. An oft-cited benefit of native ads—when they’re transparent and not “sneaky”—is that they’re way more relevant for a target audience than traditional ads. The same holds true for interest-based display ads. The more an advertiser understands a person’s interests and behaviors, the more targeted the ads can be, which, in theory, benefits both parties. Plus, native ads are less “in your face” than typical banner ads, and the approach forces brands to create content that many readers perceive as higher quality than traditional ads, making native advertising a particularly exciting and appealing advertising method for many publishers right now. Sponsorships through email can take multiple forms. One common approach is to allow a third party to sponsor your content in exchange for an advertisement or endorsement in your email. Here’s that approach in practice in a daily newsletter called The Skimm, below. The sponsorship approach allows The Skimm to make money through advertising while maintaining control and trust with their readership. They accomplish this by 1) keeping the ad on-brand: the header image and intro line is in The Skimm brand style and voice (imagine how different it would feel to readers a display ad from Aloha were plugged in instead). 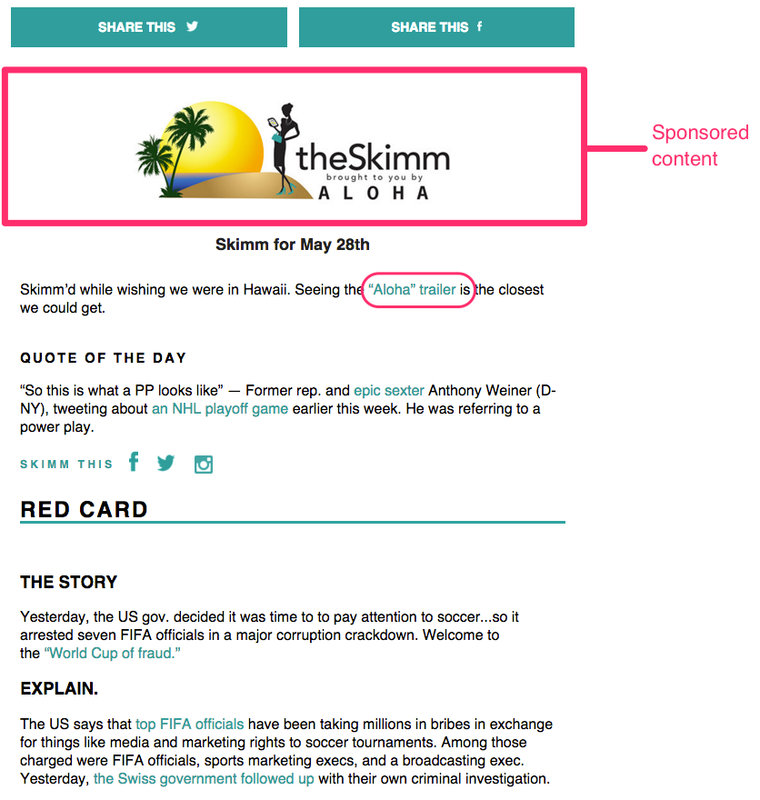 And 2) this kind of sponsorship doesn’t happen daily; most Skimm emails are unsponsored and ad-free. Like a native ad, this sponsorship fits in with Skimm’s content and is also in line with the Skimm brand. In a way, it’s more powerful than a native ad, because it looks and acts more like an endorsement. It’s like the Skimm is saying “Check out this trailer we watched.” They’re interacting with their ad content instead of just dropping it in the email. Another sponsorship approach is to send out an entire email to your audience from a third-party sponsor. It’s kind of like you’ve rented out your email list in that you’re accepting payment from another organization in exchange for sending a promo email to your list. It’s a common practice among publishers. And 2) They clearly label sponsored emails in the subject line, so readers understand what they’re getting even before they click to open. With the decline in print media advertising thanks to the internet, the publishing industry has faced a sink-or-swim environment in which publishers have had to reinvent how they reach their audiences, create content, and sustain themselves, with effective advertising playing a critical part. Let’s take a look at how some of the top publishers use ads in emails. Ad Placement: Mostly front-loaded: at the header and then placed between sections at the top of the email. The Times uses all display ads, featuring one sponsor prominently at the top along with three interest-based ads placed throughout the top portion of the email. The display ad for Hoover is big, and it’s the first thing we notice when we open the email. Scrolling down, we only get through three headlines before encountering a second ad. They’re certainly large and distracting, with a significant amount of white space around each interest-based ad. Right away, we noticed there’s no banner ad at the top. The header itself is pretty minimalistic: no social sharing icons or huge image. It’s easy to get straight to the meat of the content, which is what readers are looking for. The first two ads are interest-based display ads, appearing roughly a third of the way down and then two-thirds of the way down. Again, they’re taking up a lot of real estate by default, but they’re fairly well balanced with content—that is, between ads, there are at least 4 stories. Time is the only top publisher in this roundup that includes a native ad, and they’re very transparent about it. They take three key measures to make sure there’s no mistaking it for regular content: 1) a gray background, 2) an “Ad” label in the upper left corner, and 3) the in-ad text labels the content as from Hyundai. This is a great example of a well-marked native ad. Like Time, The Daily Beast skips a banner ad at the top that we saw in the New York Times, and they include evenly-distributed interest-based display ads throughout the email, placing at least three stories between each one. While there’s no way to avoid the big, clunky format of the interest-based ads, The Daily Beast has plenty of great content that physically takes up more space than the ads. Major publishers tend to use more interest-based display ads than other types. Depending on the publisher, it could be because certain ad slots were not sold to major sponsors, and interest-based ads provide more revenue than typical remnant ads. Ads are evenly distributed throughout an email with at least three stories or headlines between ads. Some are placed in breaks between sections. First impressions. Think about how readers might feel when they open your email to see an ad at the top, first-thing. Space. Balance content with ads. Top publishers dedicate 60%+ of email real estate to content and the rest to ads. Placement. 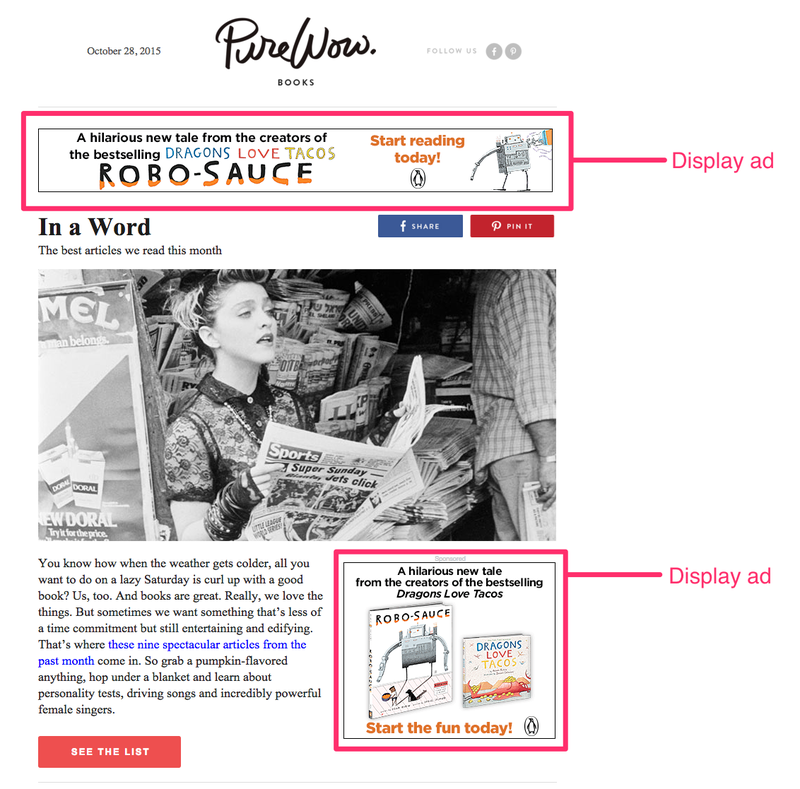 Are ads eyesores in the middle of your content, or are they well-integrated with the design of your newsletter? The major technology publications treat advertising similarly to the top publications we reviewed above. They may be cutting edge when it comes to covering the latest technology news and innovations, but are very traditional when it comes to how they use ads in email. Let’s look at a couple of them. Techcrunch, the longstanding popular technology blog now owned by AOL, uses a combination of display and sponsored content in their email newsletters. 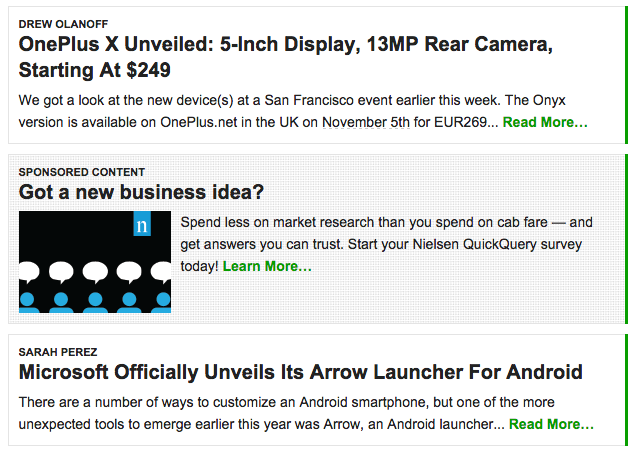 The daily newsletter, TechCrunch Daily, features a sponsored content area near the top. It is clearly labeled as sponsored, and the background to the content block, as you can see in the image below, has some grey texture instead of a plain white background like all the non-sponsored content in this email. The textured background is a great way of making it clear to readers that this content is a little different, and shouldn’t be treated or read in exactly the same way as the rest of the content in the email. Ad Placement: Sponsored content in the middle of the content well, two stories from the top of the email. Display ad is all the way at the bottom. Unfortunately CNET doesn’t label this content as sponsored. It links out to a sponsor’s website, and it indicates it’s from Tech Republic (though it’s unclear if that’s a partner site or an advertiser), but otherwise this is not labeled as it should be. There are a few very subtle indicators, however, that this piece of content is not like the other ones. There is a big red “Download Now” button where the pieces of standard content get simple text treatments for their ‘read more’ links. Additionally, the content is clearly a feed from somewhere else—it cuts off in mid-sentence with ellipses, while every other piece of copy in the newsletter is clearly edited to fit in a very specific space. Ad Placement: Sponsored content is at the bottom of the content, improperly labeled. Display ads are in the email’s right column. Top tech publishers advertise in emails just like other publishers, using multiple approaches including sponsored content and interest-based display ads. Tech publishers tend to avoid placing banner ads at the top or header of an email, but, as seen with CNET, they aren’t afraid to place multiple ads within an email. Transparency. Sponsored content and native ads need to be clearly distinguished with text and design elements like background color and/or labeling. Layout. Using multiple columns in an email, where ads distract and clutter along the side, as in the CNET email, is not a best practice. Use a single column layout that’s easier to read, better for mobile-viewing, and doesn’t make the email—including ads—feel cluttered. The past few years have seen the emergence of a new kind of publisher, the email-only newsletter. The Skimm, Thrillist, and the now-defunct Daily Candy are all examples of this type of publisher — though they may republish their content online, the raison-d’etre of these publications is to reach people by email. Therefore doing in-email sponsorship right is even more important — these publishers don’t necessarily have a website to fall back on, or to rely on for their “real” advertising revenue. These publishers therefore tend to feature well-integrated advertising sponsorships, with content and ad placements throughout the email, to maximize revenue. Take a look at how two of these companies handle these sponsorships successfully. Thrillist deeply integrates the Hulu sponsorship throughout the ad. There are display ads, sponsored content, and even integration into the header graphic. The sponsorship integration is successful for a number of reasons. First, it is well-designed, and integrated visually into the Thrillist template. The gray tile background of the header graphic is reiterated lower down in the email, in the promoted content section, tying the email together visually. The display ads, which you can see below, are not typical 300×250 square ads. 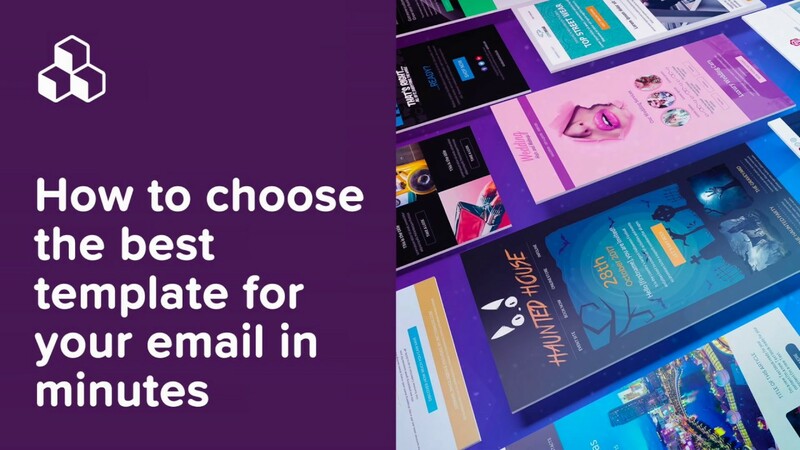 Instead one is a well-integrated rectangular module, taking up the full width of the email and appearing more like a content module rather than a typical ad with a lot of white space around them. The sponsorship is reiterated at the bottom of the email, with a single banner. 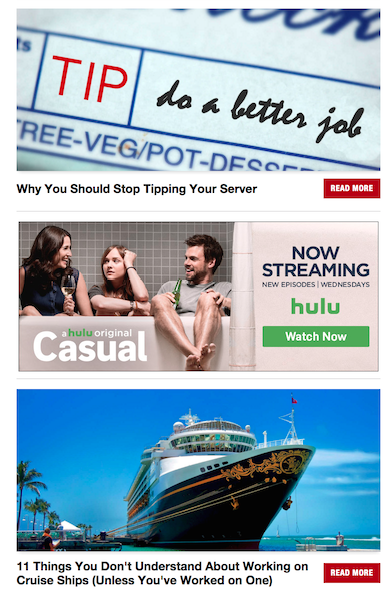 The ad integration in this email also works because the Hulu brand, and the particular show this email is promoting, is a perfect fit for the Thrillist audience. This is an important point to keep in mind when making choices about integrating ads into your emails: with click-through rates for display advertising hovering below 1 percent, it’s especially important the sponsor is the right fit for your email audience. Ad Placement: The sponsor gets a full email takeover in this email, with positions at the top, bottom, and content well. InsideHook is another daily newsletter product targeted to a male demographic. Similar to Thrillist, their emails tend to feature a single sponsor, with a combination of display advertising and integrated sponsor content. In this example, the advertiser is designer John Varvatos, promoting a new fragrance line. The John Varvatos sponsorship is deeply integrated throughout the email. There’s a banner at the top that sets the tone of the email and the sponsorship. InsideHook has clearly chosen its lead image to match the ad campaign, creating a sleek, masculine look for its email without letting sponsorship interfere with the design. It does something similar with an email sponsorship by Modelo, the beer company. As you can see below, the golden color of the ad campaign is a perfect match to the golden colors of the wine glasses in the photo below it. 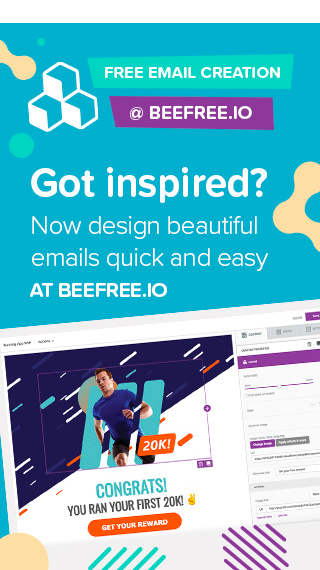 InsideHook clearly has a top-notch designer on staff making these smart design choices, creating a beautiful email product, and fully integrating advertising into the overall look of the email. 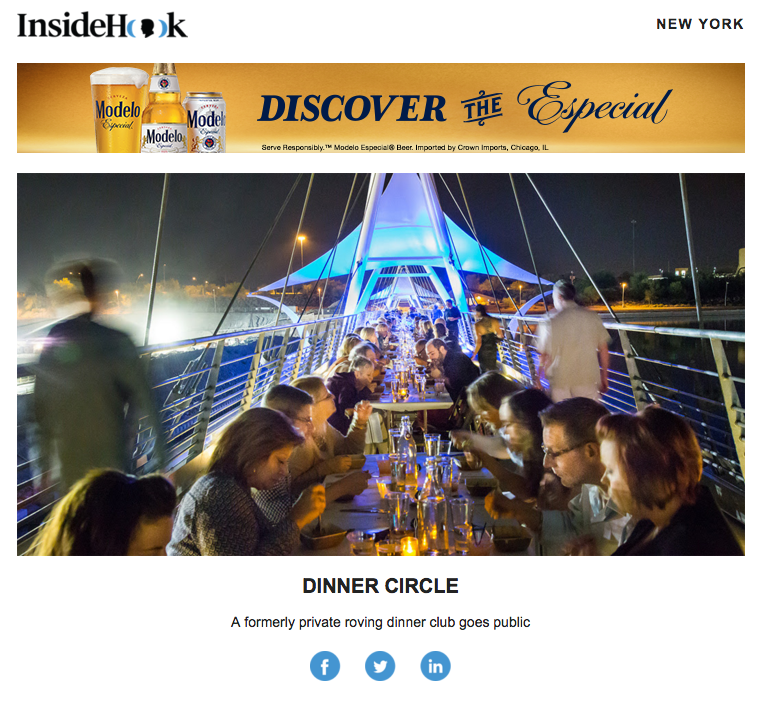 In InsideHook’s newsletters, there is also an area in the middle of the email, under the main content area and above secondary content promotions, for branded content. 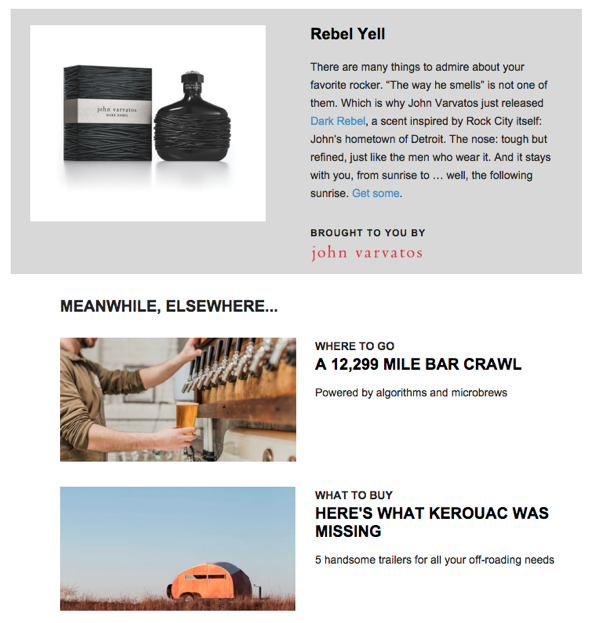 The “Rebel Yell” module piece, advertising the John Varvatos fragrance, is clearly labeled as sponsored, and it has a different background color to distinguish it from editorial features. Ad Placement: Top and bottom banners, with a sponsored module in the middle of the content. Sponsorships and advertising are even more important for email-only publishers, since they don’t have additional advertising revenue from a website to rely on. Email-only publishers can be especially innovative with their advertising campaigns, with integrated email headers, atypical banner sizes, and color choices. Full sponsorships. Email takeovers and fully integrated sponsorships from one brand work best for this type of publisher. Labels. Label sponsored content appropriately, and use visual cues to demonstrate it’s a different type of content, such as a different-colored background or a different-colored call-to-action button. 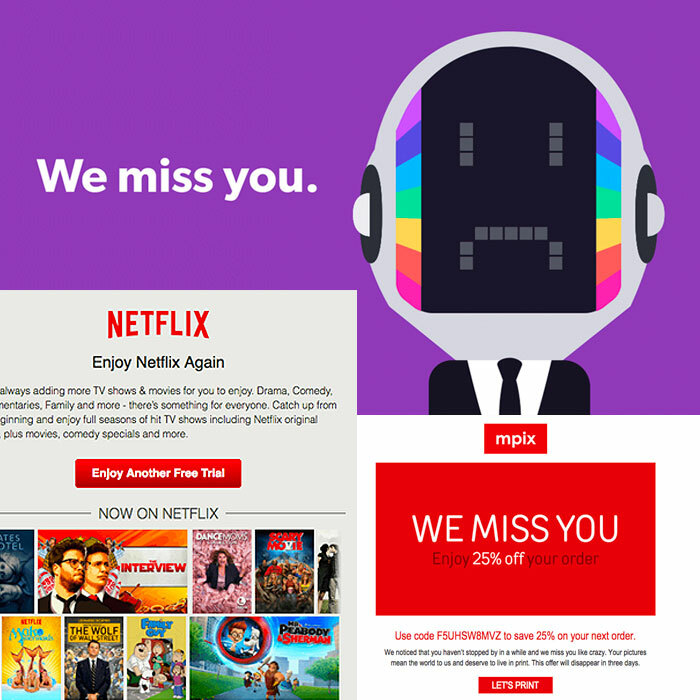 Make smart color choices to create a cohesive look to a sponsored email. Bring back the same color scheme or visual cues throughout the email, as Thrillist did with the gray tile in the Hulu ad, or InsideHook did with the black color scheme of the John Varvatos ad. The mid-sized publishers whose newsletters we pulled for this analysis use a variety of ad types, but in general, fewer ads appear in emails compared to the bigger, top-tier publishers we looked at earlier. Ecommerce seems to have transitioned to using only native ads in email. The ads are “native” in that they follow the exact same visual format as the rest of the email’s content (image to the left, description to the right) and the content is relevant to Ecommerce’s readers. But Ecommerce wisely makes it obvious they’re ads by adding clear “Advertisement” labels right at the top of each one and choosing a different background color. Well done. However, the first native ad appears right at the top of the email, before any other content, which is not recommended as a best practice. While The Week’s first ad is the very first thing that appears in the email, it’s slim and barely takes up any space compared to the long list of content that follows. 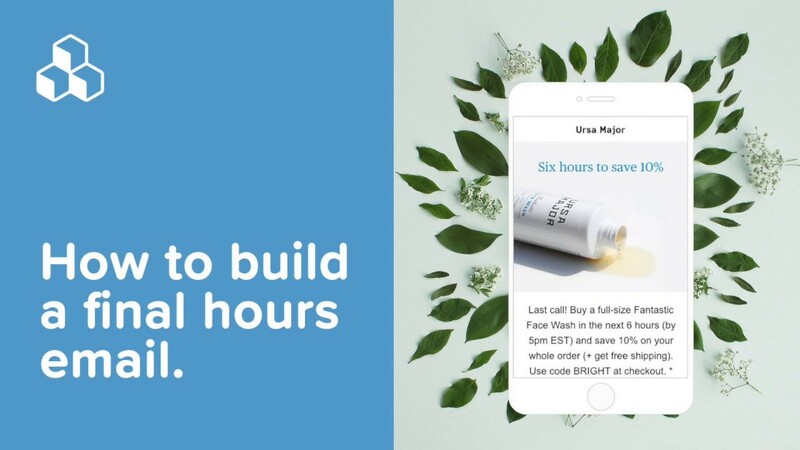 Unlike emails we’ve seen from the top publishers, here readers can scroll through the length of the email without being disrupted by another ad—the second and last one doesn’t appear until the very end, after all headlines. It’s one of the least disruptive approaches we’ve seen. The Canon ad is integrated right into the header of the email—not a reader-friendly choice. We’re left wondering if there’s some relationship between Canon and the headline to the left since both pieces of content live in the same black content block. It’s unclear and distracting. Nonetheless, the body of the email is ad-free, with the second and last ad appearing only at the very end of the message. Unlike top publishers, mid-sized publishers tend to avoid interest-based display ads. Because the mid-sized publishers we featured here are more niche publications, they may have niche advertisers and rely less on ad networks to fill their ad inventory. Mid-sized publishers use fewer ads in emails than top publishers—typically about 2—even if they’re sending just as much content as bigger publishers (as seen with The Week). The first ad often appears in the header or at the top of an email. Readers. With a smaller readership comes fewer ads. In order to build up your audience, it’s wise to focus on content first. Size. If an ad is the first thing readers see in your email, consider making it a narrower, less obtrusive ad. Format. Avoid putting a display ad right next to a story headline without a barrier between the two. Always be clear and transparent. If you’re looking to implement email advertising in your email newsletter publication, we’ve listed a few resources and providers to take a look at. First, check out an email ad network. Email ad networks connect publishers and advertisers so that publishers can easily monetize emails. For publishers without existing advertiser connections, it’s an opportunity to generate revenue through email. The advantage for advertisers is that emails provide a unique opportunity to get exposure to an audience through an established brand trusted by readers who have opted-in to receive content. 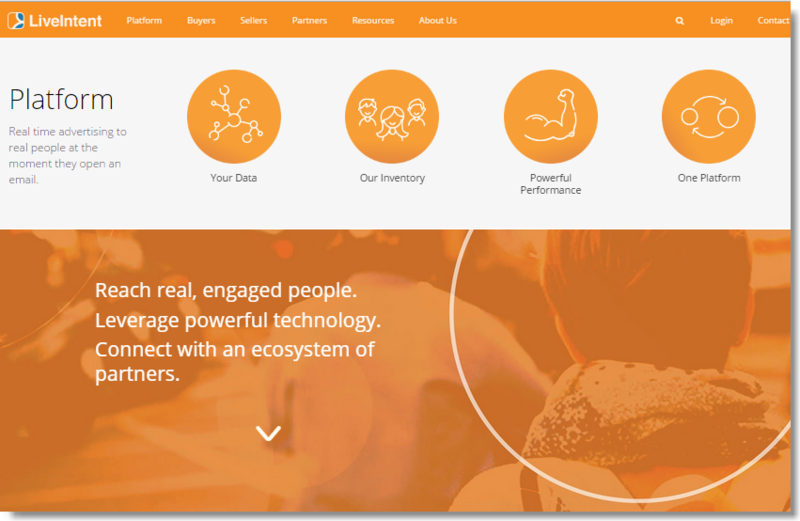 LiveIntent is one of the most well-known companies operating in this space. LiveIntent targets well-established brands: they require three million monthly ad impressions (emails opened) to use their service. Publishers that do use LiveIntent simply place static HTML tags into their email templates, and the ads populate. The placement and number of ads used is up to the publisher. Revenue is typically generated on a cost-per-click basis, so to get clicks, publishers will naturally strive to ensure ads aren’t buried under content at the bottom of an email. 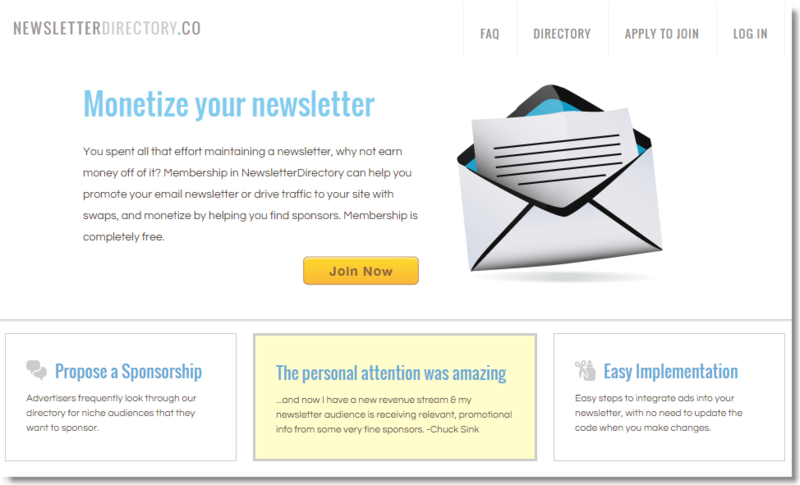 NewsletterDirectory.co is an ad network option for smaller publishers. It works similarly to LiveIntent: HTML code can be inserted into an email newsletter, and publishers can choose two types: 125×125 with text or 468×60 banner. Like LiveIntent, it functions on a cost-per-click basis, so performance is dependent upon open rates. Gold Lasso, for instance, specializes in native ad monetization. Like LiveIntent and NewsletterDirectory, the company provides code, but it’s customized to match the template and format of your newsletter. 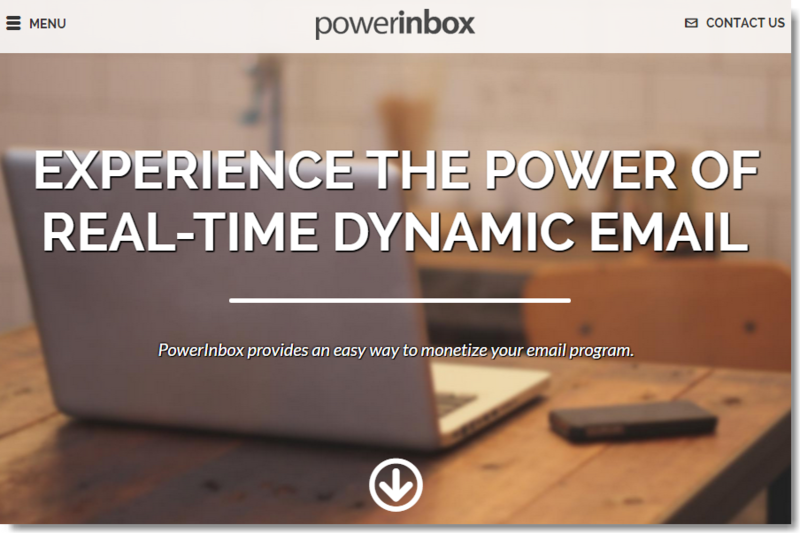 PowerInbox specializes in animated product displays and real-time tickers, helping to make ad content stand out. They also offer an option to use “personalized content”—in other words, interest-based ads that populate upon opens. Ads should never make up the bulk of your email. Use them sparingly, to properly balance the content and advertising space allotments. Consider your readers. If you’re going to include ads, strive to make them relevant. Don’t put an ad for kitchenware in your email newsletter for car mechanics. Be transparent. 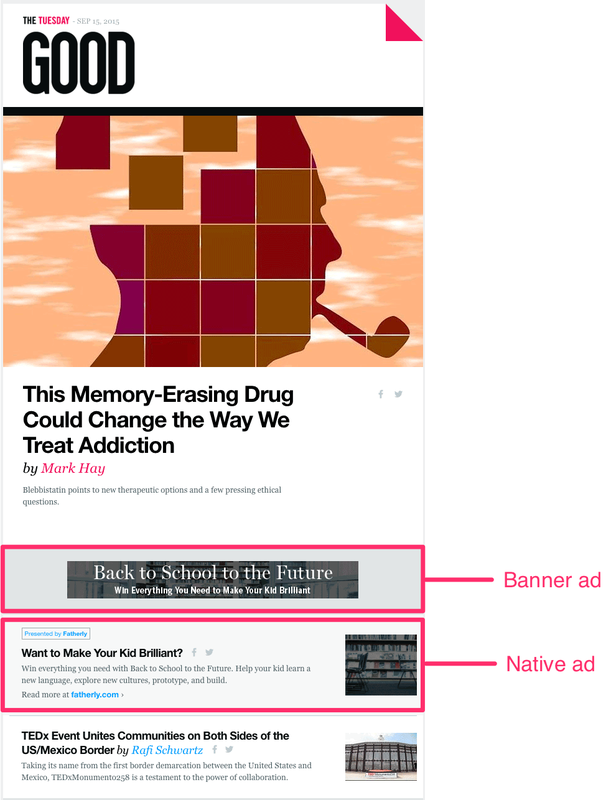 Native ads needs to use language that conveys it’s been paid for (think: “advertisement,” “sponsored,” etc.) that’s large and easy to read. 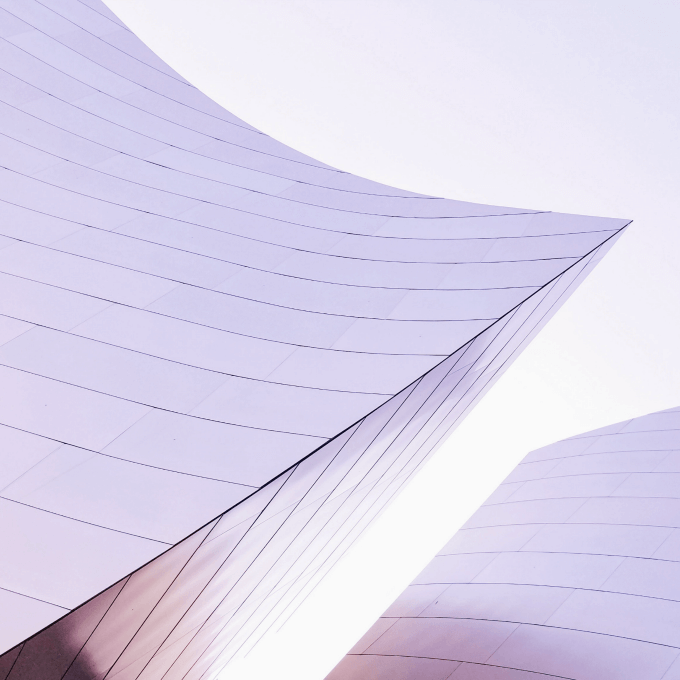 Use design tactics to make your native ad look different from the rest of your content, like a different background color or a special icon or label. Design still matters. Consider the size and format of ads you choose, if you have control over it. Remember placement. If an ad is the first thing readers see in your email, consider making it a narrower, less obtrusive ad. The current standard format for most interest-based or square display ads is bulky, with lots of padding surrounding each display. Consider the real estate they’ll take up in your email and use them sparingly. Did you find this blog post useful? As a publisher, what aspect of ads in email do you find the most challenging? Let us know in the comments!